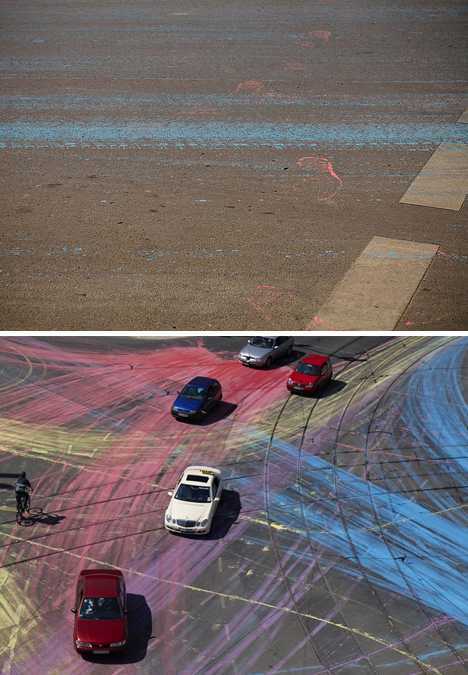 Not only did they paint it red, but pink, purple, blue and yellow as well. 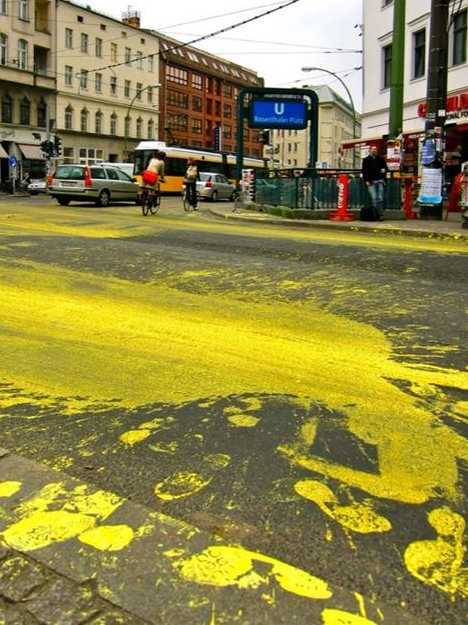 Don’t blame the drivers (and the odd pedestrian), and don’t question their sobriety either – all were unasked, oblivious participants in Berlin’s most infamous guerilla art attack to date. 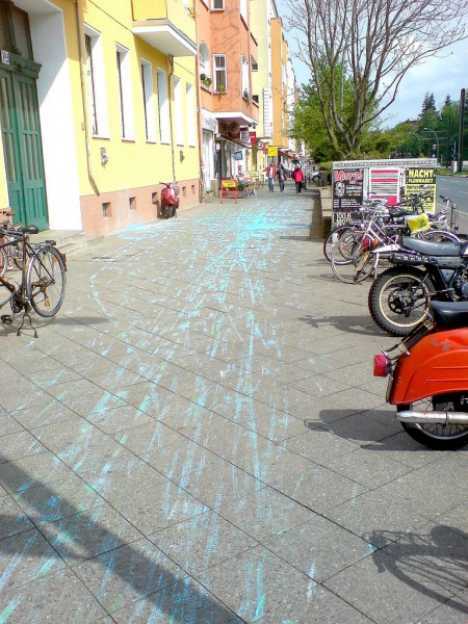 “Ist das Vandalismus oder Kunst?,” asked Berlin newspaper Bezirk following one of the city’s most notorious guerilla art attacks. Over a year later, the answer still isn’t clear (though the city’s Rosenthaler Platz is) and either are the motives of the bike-riding, paint-splashing guerilla artists from IEPE & the Anonymous Crew. The day began like most any other, in most any other city in most any first-world country. Traffic lights blinked from green to yellow to red and back again; cars (green, yellow, red and more) obediently followed their robotic commands. There was no indication anything out of the ordinary was about to happen… and then something extraordinary happened! From north, south, east and west, groups of bike-riders converged on Berlin’s Rosenthaler Platz. 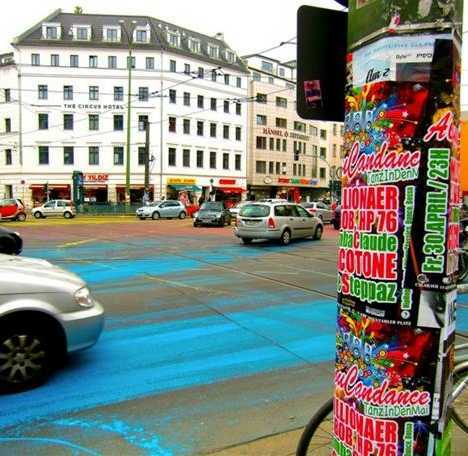 Some brought buckets and lined boxes filled with water-based, environmentally-friendly paint (about 500 liters in all), others began pasting posters on street signs and other easily viewable surfaces ranged around the wide intersection. 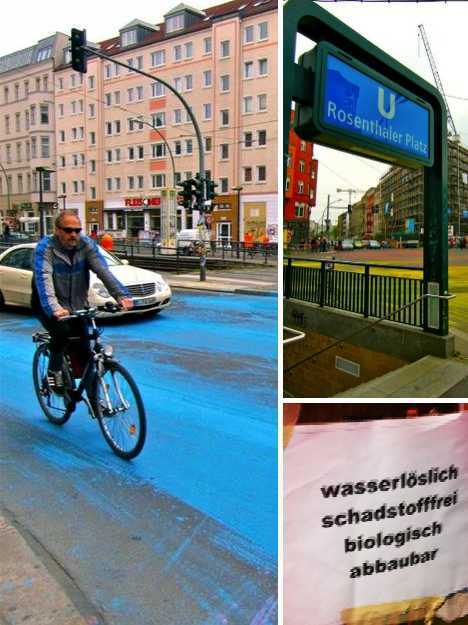 The posters advised all and sundry that the paint was “wassloslich, schadstoff-frei, biologisch, abbaubar” (washable, pollution-free, organic and biodegradable): facts of import not only to city authorities but to the car-owners whose vehicles were to become unexpected participants in the anarchist/artists’ scheme. 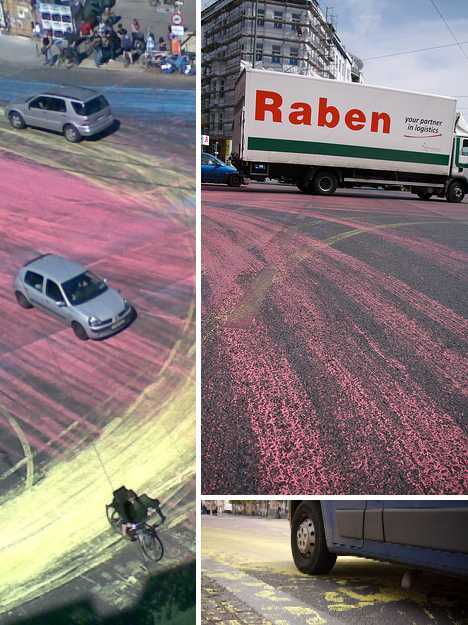 Coordinating their actions to the traffic signals’ changing colors, the IEPE artists brought their containers of paint into the center of the platz, spilling the contents in front of dozens of bemused drivers who had obediently stopped for red lights. When the signals changed to green and the drivers shifted their feet from brake pedal to accelerator – what else could they do, after all? – an abstract artwork was born. As for the drivers, though their actions were as always their resumes suddenly shifted – they were artists now, “drive-thru artists” to coin a phrase. With their paint dumped and posters pasted, the guerilla artists from IEPE & the Anonymous Crew quickly melted away into the bright Berlin sunshine. 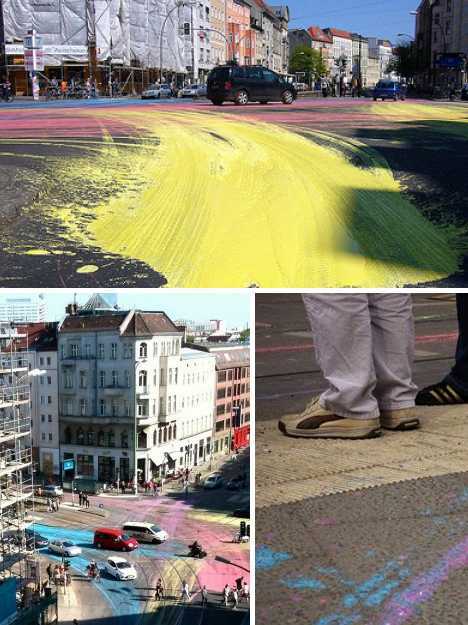 Did the treads of their bicycle tires and sneakers leave an imprint, a signature as it were, in the sticky new substrate covering generous portions of Rosenthaler Platz? Did it matter? On April 25th, 2010, all were artists. Just being there was to be a part of what was happening. 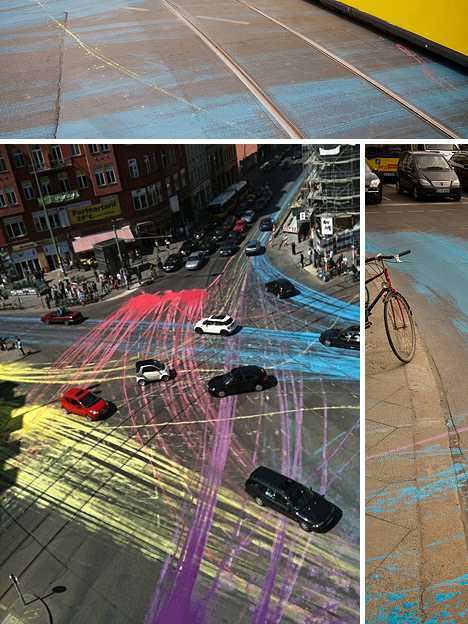 Time passed, traffic passed, and a painting began to grow. Colors shifted, strengthened, melded, faded, and a technicolor portrait of a technological society gradually took form. Traffic patterns once invisible became obvious, the actual pathways of people in motion superseded the flat, gray, inorganic boundaries laid down in blueprints stored away in dusty shelving units. 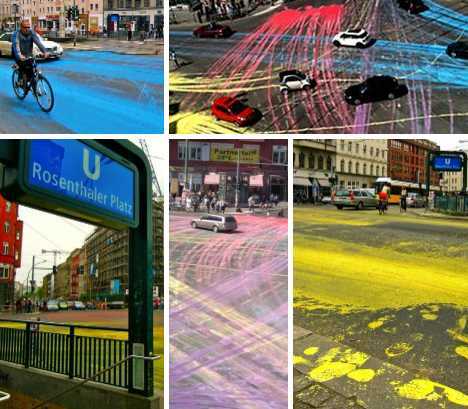 Rosenthaler Platz had shown its true colors and the effect was that of a rainbow arcing across the sky after dark storm clouds had fled. 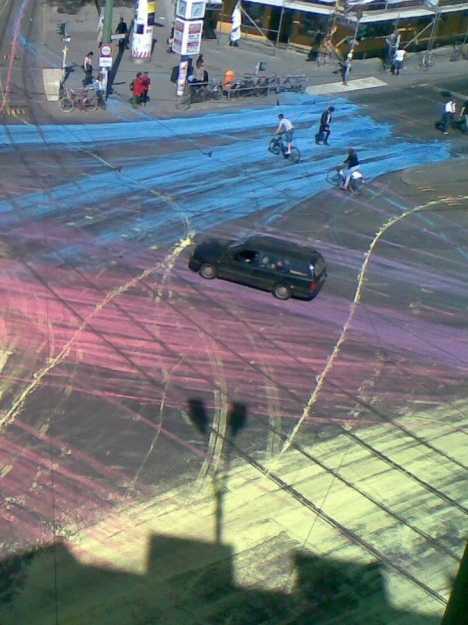 This video, taken while the paint was still wet, gives a Berliner’s-eye view of what it must have been like to observe a painting in progress from the inside. 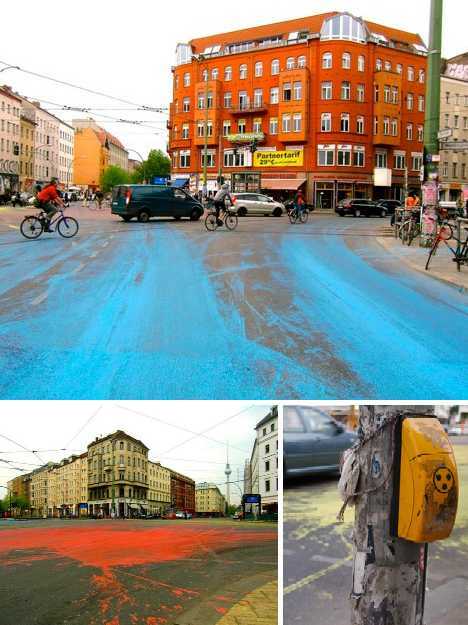 Those responsible for the April 25th, 2010 guerilla art event at Berlin’s Rosenthaler Platz have never fully explained the purpose of their so-called “art attack” on one of the city’s busiest transportation arteries. Perhaps they feel no need to do so: if the event was intended to make people think, why tell them WHAT to think? The conjecture above fits with the nature of the art (or vandalism) itself. 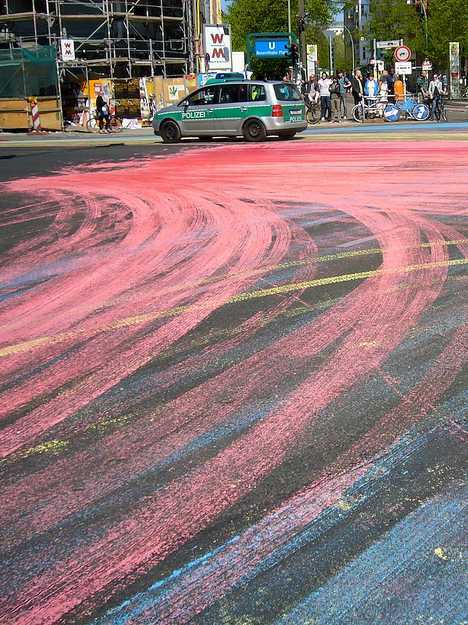 No one could foresee the exact shape, size and structure of the platz pavement painting as the actual “painters” were the random traffic patterns of central Berlin. The act of giving the process of creating art over to the people who live within its frame may provide clues as to the motives of those who planned the action itself. 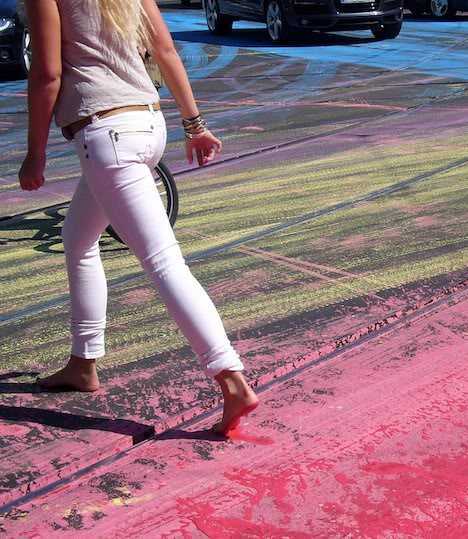 Was this explosion of urban art an effort to Reclaim The Streets for the people, or at least an attempt to show people the streets were theirs to reclaim? If so, Rosenthaler Platz was an ideal location. Formerly a bustling urban melting pot near the center of old Berlin, the neighborhood had barely begun recovering from wartime destruction when it was marginalized by the building of the Berlin Wall. Cut off from half of its roadways and suddenly marooned on the outskirts of East Berlin, the platz was deprived of its lifeblood: people. Even the subway stopped stopping there – the U-Bahn stop beneath the platz was a “ghost station” from 1961 to 1989. 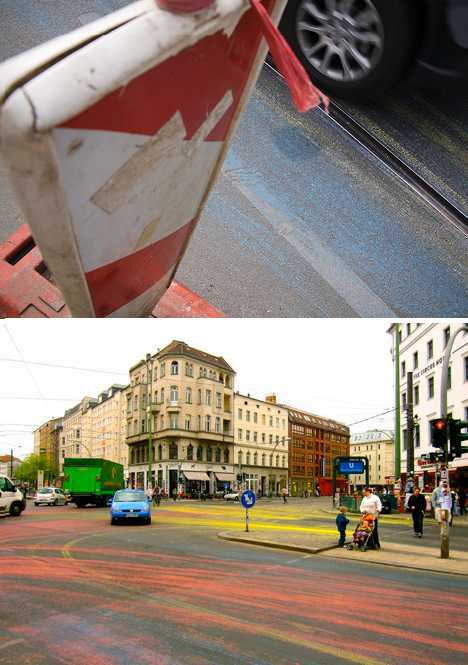 With German reunification came a second chance for Rosenthaler Platz, a way to wipe the slate clean and start again. 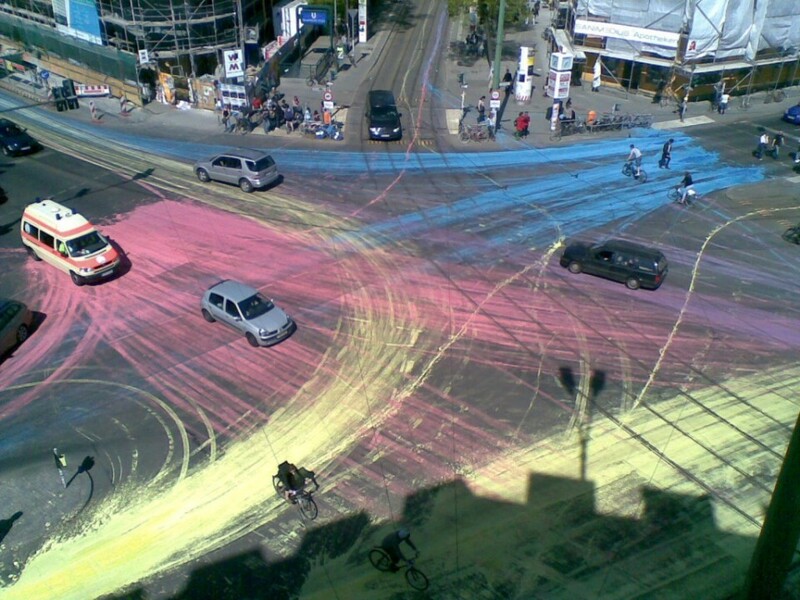 Will the platz serve as a locus of cultural ferment or a lifeless intersection for vehicular traffic? Will the plaza’s former shops, stores, galleries and cafes revive to their former prominence or will faceless corporations exploit the power of the almighty Deutschmark (er, Euro) to intersperse office space whose life, if any, is turned inward upon itself? The battle lines are drawn… in red, pink, purple, blue and yellow.